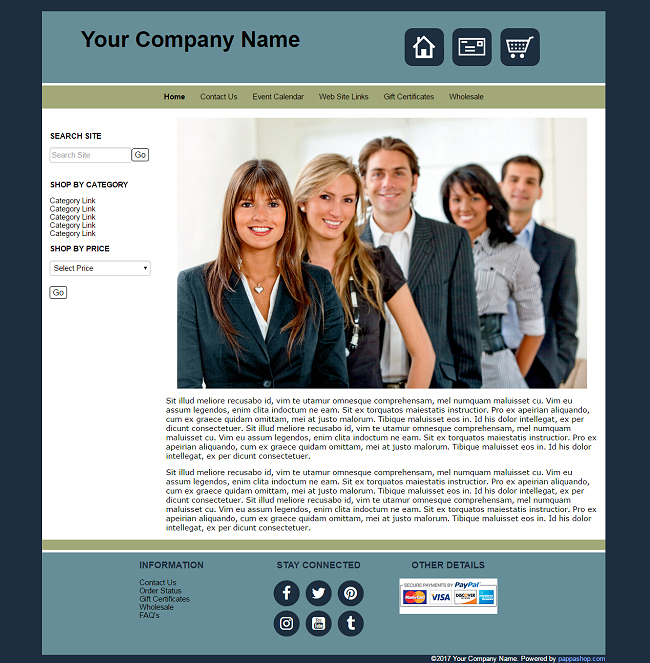 This template is compatible with our Site Builder version 2.94. If your site is using an older version of Site Builder, it will be upgraded prior to template installation. Once you click on this download link, you will be asked whether you want to pay Credit Card. Even though you will not be charged, choose it in order to proceed through checkout. Please Note: This design is sold as you see it in this example. The actual menu is set up by you from within your store-admin. This template has a blank logo / header area so you can add your own logo or use simple text for your company name. If you know html and would like to make any changes to the design once it is installed, you are welcome to do so on your own. The link buttons shown in the center of this design are included for your main page. However, the photograph seen in this design is NOT included as part of the template purchase.